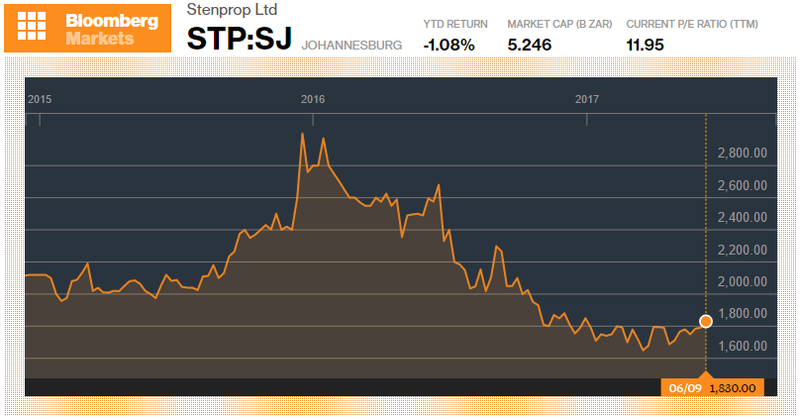 Stenprop Limited (STP) is a JSE-listed, European-focused property investment group. It has a second listing in Bermuda, and management are reportedly considering a further listing on the LSE. Converting the structure to a REIT is also on the cards for the future. On Thursday, Stenprop released its provisional year-end results, and what follows below is a highlights reel of what they achieved and where the company may be headed. According to the results release on Thursday, approximately 47% of Stenprop’s net asset value (NAV) is in Sterling. As a result, the GBP/EUR exchange rate has a substantial role to play in reported euro earnings. Further, as the share price on the JSE is listed in ZAR, rand strength over the period has also played a part in share price valuations. 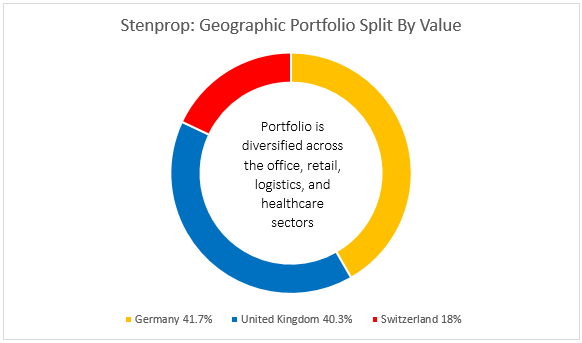 The pound devalued by 7.9% over the course of the financial year and it is Stenprop’s stated policy not to hedge as the spread of the underlying portfolio of properties across the UK, Germany and Switzerland, provides for a natural diversification of currency risk. The company further reported diluted adjusted European Public Real Estate Association (EPRA) earnings a share of 10.28c, a 1.2% decrease against the previous year, and a €1.59 diluted adjusted EPRA net asset value (NAV) a share, down on the previous year. According to Stenprop, calculations showed that, had the depreciation of the pound against the euro not occurred, the EPRA earnings figure quoted above would have actually increased by 5.6% and the NAV figure would have decreased by 1.5% rather than the 4.8% decrease exhibited in the results. Most telling however, is how if the currency had stayed put for the year, dividends which were increased marginally (1.1% up) would have actually been significantly higher at 8.1%. As of 31 March 2017,�Stenprop�owned (in full or via a joint venture), 54 properties valued at €848 million, with the regional split depicted below. Come next year, the above chart should look very different as Stenprop expects to sell the remainder of its Swiss-based�portfolio in the current financial year, this after it had trimmed the portfolio in November of last year (2016) when it raked in CHF 6.8 million after selling properties in Interlaken, Switzerland. An agreement has already been reached for the sale of the Nova Eventis shopping centre in Leipzig, where Stenprop owns a 28.42% stake. 22 June 2017 is the scheduled date of transfer. The proceeds from this deal will be needed as the company announced on Wednesday that it had agreed to acquire 25 multi-let industrial (MLI) properties in the UK as well as the management business that has built up and managed that portfolio, C2 Capital Limited, for a combined consideration of �130.5 million. The deal is scheduled for completion 8 days after the Eventis shopping centre transfer, on 30 June 2017. Should any hiccups occur, management has already secured a loan facility to ensure that they can take on the new purchase. Stenprop CEO Paul Arenson highlighted that the acquisition represents an opportunity for Stenprop to invest in an asset class that the company believes will deliver sustainable earnings down the line. According to Arenson, the sector is "pregnant with growth", owing to the increasing demand for MLI space. Arenson has pointed out in interviews that MLI real estate is increasingly being used by businesses as "last mile distribution hubs". On the supply side, new MLI space isn’t really coming on to the market and in actual fact some of the existing space is being converted into residential property because of the close location to urban living areas. "...This transaction provides us with a strong strategic foothold, economies of scale and management expertise in the MLI sector. Our intention is to build a much larger MLI portfolio off this base, which we are confident will deliver sustainable higher average annual rental growth going forward. Our intent is to position Stenprop as a leading player in the UK MLI space through the active pursuit of acquisition opportunities over time." Arenson said.